This top-5 pharma company chose the PRMA Navigator® to accelerate the generation of simultaneous HTA submissions and achieve up to 80% auto-population of their first drafts. pricing, reimbursement & market access. A top-5 global pharma company investigated digital solutions from various companies to improve the quality and development timelines of multiple simultaneous HTA submissions. The global team and three affiliate countries selected the PRMA Navigator® application to auto-populate a partial submission for each scope country within 2 weeks. 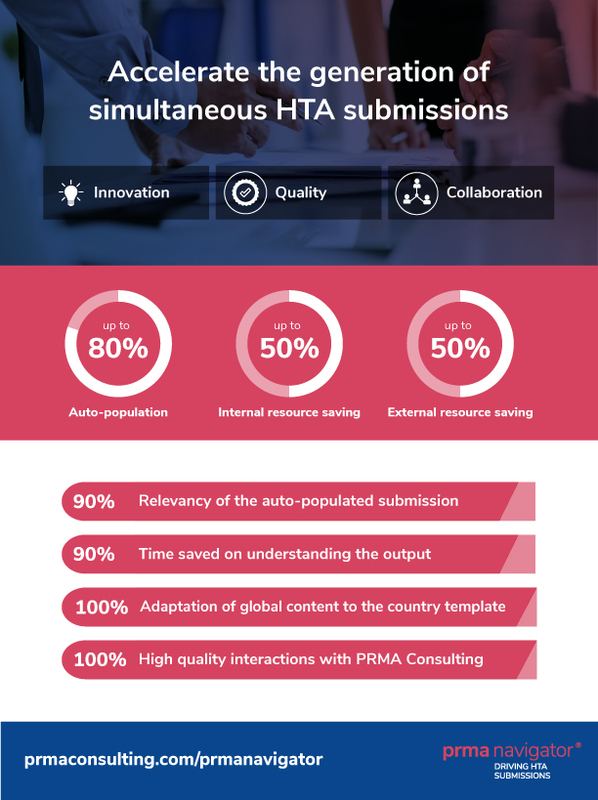 The PRMA Navigator® saved internal and external time and cost with agile management of concurrent HTA submission preparation. The digital application supported enhanced global and affiliate collaboration with an aligned approach and pull-through of global value stories and HTA strategy. Submission quality was improved and development accelerated by the application’s consistent framework and the secure transfer of global knowledge. Integrated support from the PRMA Consulting team provided critical analysis of global documents and alignment on country specific HTA strategy. Two-way communication with the client ensured relevance throughout the project. The final auto-populated partial submission provided over 80% of the final submission. "We found the PRMA Navigator® was easy to use and colleagues appreciated that the outputs were immediately digestible, saving us time." Time was freed for strategic thinking and scenario planning, resulting in significant resource savings and leading to higher-quality submissions. "Using the PRMA Navigator® means that affiliates can focus more on the strategy and improving the submission, rather than commencing work by reading the material." The consistent framework, secure global knowledge transfer, and shared learnings improved the quality of the submissions. "The auto-populated content was aligned to our template, comprehensive and directly relevant." By identifying gaps in source material, opportunities were found for more targeted affiliate-focused global deliverables in the future. "The HTA submission that we produced using the PRMA Navigator® saved us weeks. The robust content provided a high quality first draft. We will happily use the PRMA Navigator® for our next three submissions." Our user-friendly digital applications and expert team have supported organizations around the world in achieving their goals. We are always happy to have an informal, confidential chat and help you re-think your market access challenges. Pharmaceutical and biotechnology companies are turning to technology more frequently to solve business issues, and are increasingly using digital technology to optimize market access for their products.Read the article >> https://www.prmaconsulting.com/digital_applications_whitepaper/index.html?utm_source=PMLiVE&utm_medium=HubArticle&utm_campaign=DigitalTransThis new article helps you to:appreciate why digital applications are transforming the value and access functionsunderstand how new technology is informing direction and becoming an essential enabler in realizing visiongain insight into considerations for re-evaluating your technology and your suppliers. Organisations are leveraging new technology to implement a wider range of business models and, in essence, drive market access success by working smarter, faster and with greater economy. Transform your market access processes with the PRMA Healthcheck® late module. The digital application encourages collaboration with integrated decision-making between affiliate and global functions to build an evidence generation plan. Efficiency is increased through the systematic assessment of payer evidence readiness for your product against actual submission template requirements with a visual heatmap. An organizational vision and action plan to anticipate and mitigate value challenges to optimize payer readiness. PRMA Healthcheck® late module celebrates over 40 readiness assessments successfully delivered and announces a new version release.